According to organizers, the top cash prize awarded for the best exterior lighting of a house this year is $200. All homes in the village of Ashley are eligible, and the judging will happen the day before the event. The home in the photo is one of the 2017 winners. Don’t pout, Santa is returning again this year for the ninth annual Christmas in Ashley on Saturday, Dec. 1. Christmas in Ashley began nine years ago when Amy Ruggles, chairperson of the committee for the event, thought it would be fun to have a live nativity scene in the village to bring people together. “There are so many nice people living around Ashley, yet folks don’t gather and interact as in the past, but since the start of Christmas in Ashley, we have become acquainted with so many friendly people,” she said. The holiday festivities can be enjoyed from 6 to 9 p.m. beginning with the Christmas parade at 6 p.m. down High Street to the old Ashley Methodist Church, 214 E. High St., where Santa and Mrs. Claus can be found in the west room. According to organizers, everyone is welcome to join in the Christmas parade by lining up at 5:30 p.m. in the parking lot at the White Lily Chapel, 20 S. Main St.
“There will be one float carrying carolers while they sing,” said Elaine McFarland, village council member. Ruggles said the live nativity will once again be staged across from the Methodist church on East High Street. “The nativity is always a big hit,” she said. “There will be hundreds and hundreds and hundreds of luminaries that bring such a wonderful life to the village placed along the village streets by the local Boy Scouts. “All the events are free except for the fish fry and craft show,” Ruggles added. Ruggles said Scott Shoemaker will once again reprise his role as the town crier, taking to the streets ringing his bell as a guide for scavenger hunters on their journey from the Elm Valley Joint Fire District Station at 9821 U.S. Route 42 N. to the Ashley Wesleyan Church at 305 E. High St. All prizes for the scavenger hunt are donated by local residents and businesses. 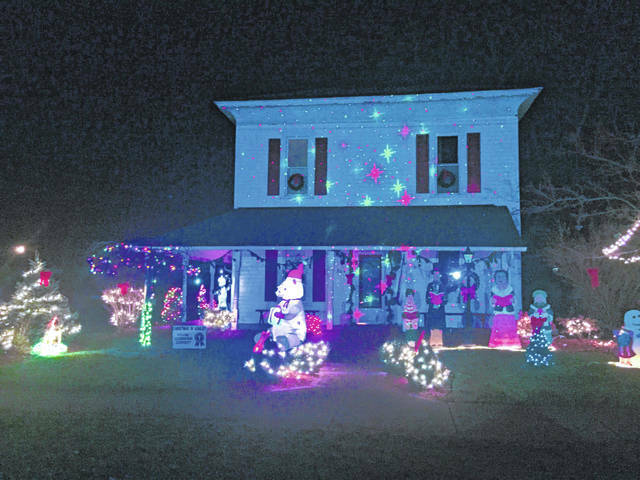 McFarland said there will be cash prizes awarded in the amounts of $200 for first place, $150 for second place, and $100 for third place for the best exterior lighting of a house. She said all homes in the village are eligible, and the judging will happen the day before the Christmas in Ashley event. McFarland added three of the historic homes of the village will be decorated and open to the public for tours. The open homes are that of Ross and Sarah Adams at 216 E. High St., Drew and Beth Carter at 205 E. High St., and Pat Baldwin at 218 E. Taylor St.
• The Free Store at 22 S. Main St. will be open and stocked with winter clothes. • The American Legion Post 518, 104 E. High St., will hold its annual all-you-can-eat Fish Fry starting at 5 p.m.
• A Christmas Craft Show featuring several craft vendors will be held at the village municipal building at 3 N. Harrison St.
• The Christmas Village display will be on display at First Commonwealth Bank at 2 W. High St.
• The local Girl Scout troop has organized a Toys for Tots Drive at the Wornstaff Library, 302 E. High St. New toys can be dropped off there. This entry was tagged Ashley, Christmas, D. Anthony Botkin, parade, Santa. Bookmark the permalink.